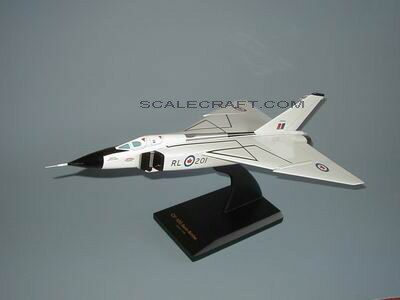 For the Canadian aviation industry, and for Avro Canada in particular, the traumatic story of the Avro Canada CF-105 was paralleled by that of the contemporary British Aircraft Corporation TSR.2 in the UK. Both were destroyed by politicians who, in 1957, were convinced that missile technology had advanced to a stage when manned interceptor aircraft would no longer be needed. The Arrow made its maiden flight on March 25, 1958, and all five of this version were being used for development and testing when the entire program was canceled on February 20, 1959; at which point all five Arrow 1s, one unflown Arrow 2, and four almost complete Arrow 2s were then destroyed. The sad fact is it's capabilities were far superior than any of it's U.S. or USSR counterparts of the time, or for that matter, any produced during the following few years. Mahogany Wood. Scale: 1/72. Wingspan 12 1/2 inches, Length 19 3/4 inches.